The dog team was abruptly halted before the log cabin over which the smoke hung low in the frosty night. The driver hurried to the door and upon admittance asked in agitated voice for the doctor. The woman standing by the stove, covering pans of dough, began removing her apron. A young girl hurried to an adjacent room and returned with a large satchel, while another brought her mother's heavy wraps. After giving a few quiet instructions to the girls as she dressed, with the young man carrying the bag, their mother went quickly into the night. Dr. Ross was on her way to assist another young pioneer mother in her travail. Such occurrences were commonplace in the life of Dr. Charlotte Ross, Manitoba's first woman doctor who lived and practised in Whitemouth from 1881 to 1910. Set on the edge of the Shield country, through which a ribbon of steel was being threaded, Whitemouth, 67 miles east of Winnipeg, was only a construction headquarters when Dr. Ross first joined her husband there. The tiny population consisted only of loggers and railway workers and it was some time before she saw another woman. Charlotte Whitehead Ross was the remarkable daughter of a remarkable father. Joseph Whitehead had begun his career as a young lad in England as helper on a horsedrawn tram. He came to the attention of George Stephenson, the inventor, who recognized the abilities latent in the boy and interested himself in his education. Joseph stoked Stephenson's famed 'Rocket' the first locomotive, on its maiden trip in 1829. He worked at railroading in England and Scotland and came to Canada in 1849. As a railroad contractor, he laid out lines in Ontario, including part of the Grand Trunk Railway and then went west to take part in the greatest railroading exploit of them all the building of the Canadian Pacific. He engineered lines south and east of Winnipeg and brought the first locomotives to Manitoba. The most famous of these, the Countess of Dufferin, presided for years with Victorian dignity before the entrance to the C.P.R. station in Winnipeg. In later years, Mr. Whitehead served as mayor of Clinton, Ontario, for some time and became a member of the House of Commons representing North Huron. Charlotte, born in England in 1842, inherited her father's initiative and, enterprise. She was educated in Montreal and married David Ross, a handsome young Scot who was associated with her father in railway construction. Her decision to study medicine was determined by the prospect of spending years in communities where no medical facilities would be available for her family, and by a realization of the value of qualified medical assisitance to the construction workers with whom her husband was concerned. No woman would embark on such a demanding course for purely practical reasons. In an era when higher education for women was the exception and women doctors an oddity, such a step required courage, resolution and a true vocation. All these she possessed and, of the greatest importance, the full concurrence and encouragement of her husband. At that time, no medical school in Canada would admit a woman student. She entered the Women's Medical College in Philadelphia in 1865. She had two children at home in Montreal at the time and she suffered considerable homesickness. Eventually, the children joined her in Philadelphia. Another child was born to her not long after she received her medical degree. She returned with her family to Montreal and was the first woman to practice medicine there, specializing in diseases of women and children. The intrusion of a woman into a profession traditionally sacred to men was met with varied reactions. Once she returned to her buggy after a house call to find a pile of bones, filched from some anatomy lab, covering the seat. Charlotte swept them off and continued on her way. Petty behavior never bothered her and she built a successful practice. During the latter part of the 1870s, her husband and her father became engaged in building CPR lines in Manitoba. When the line from Winnipeg to Kenora was under construction, Dr. Ross and the children made the long journey to Winnipeg via St. Paul, Minnesota, and arrived unexpectedly at Whitemouth riding on a flatcar. There, far from the amenities of urban life, Dr. Charlotte applied herself to making a home in the wilderness. Her husband had established the Ross Lumber Company at Whitemouth. Logging and construction work resulted in the usual quota of accidents and when it became known that Mrs. Ross was a physician, her services were called upon. Not, however, until the initial suspicion of a woman doctor proved groundless. One early episode helped to disarm the reluctant. She was called upon to treat a man who had suffered a nasty neck wound in a fight. The apprehensive patient and his nervous companion had sought the doctor's help only as a dubious alternative to bleeding to death. The companion was pressed into service holding a lamp to best advantage. When the doctor began suturing the leathery skin, the sight was too much for a strong man. Dr. Charlotte retrieved the lamp from his failing hands and finished the job unassisted. Her calm competence was reassuring and thereafter she was frequently called upon for medical aid by the workers, many of whom became her staunch friends and protectors. Later on Indians from Fort Alexander, 60 miles away, sometimes made a difficult journey up the Winnipeg River to seek the white doctor's medicine. She had need of all her skill and resourcefulness in her pioneer practice. Of necessity, her medical supplies would consist of essentials most of which are still familiar: Epsom salts and castor oil, zinc and borax lotions for skin conditions, flaxseed for poultices (irresistible to mice), iron which was prescribed not only for anemia but as a supportive measure in many diseases; tannic acid for both internal and external use and sodium salicylate for rheumatic conditions. There would be morphine for pain, chloroform and ether for light anaesthesia. The reduction of fractures, always a serious problem before the event of X-ray, would test her ingenuity. Preventative medicine was as yet unknown, except for smallpox vaccination of which the Indians took a dim view. Certainly she would have the best obstetrical kit possible, as well as all the essentials for minor surgery. 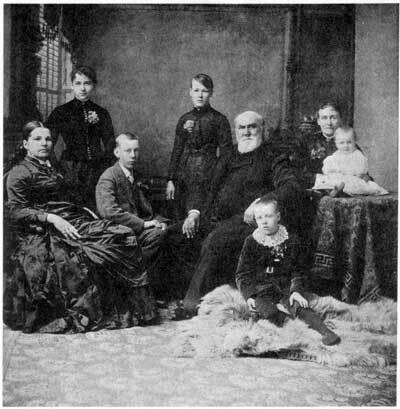 Family portrait circa 1889: Rear (standing I. to r.) Al Whitehead, Carrie (Edith) Mori]; Front (seated l. to r.) Third Mrs. Whitehead (sister of Senator McDonald), Hailes Ross, Joseph Whitehead, Joseph Ross (on rug), Dr. Charlotte Ross (behind table), Lottie Ross (baby  later Mrs. Paget). Dr. Ross always insisted upon the strictest attention to cleanliness, al-though practising in an era before the full value of asepsis was recognized. For sterilization she would rely on carbolic acid, iodine and boiling water. Her patients would be completely unaware of the great benefit conferred on them by Dr. Ross's antipathy toward germs. Many times, during the lamplit watches in some rude cabin, she would scrub and scour for the best advantage to her patient. Often she would carefully prepare the food she prescribed. Her concern with antiseptic measures was not confined to the medical field. Convinced that money could transmit disease, she insisted that coins coming into the household be sterilized by scrubbing and paper currency be pressed with a hot iron. The table linen was always laundered separately. [*] Close to a century later, Dr. Ross's suspicion of money as a 'carrier' received confirmation. About four years ago, a despatch carried in the Winnipeg Tribune reported that a team of researchers in the United States had proven to their satisfaction that currency and coins can indeed transmit disease. Dr. Ross became accustomed to using varied means of travel in order to reach a patient: canoe or handcar, dogteam, horse and buggy, oxteam or on foot. Her practice was scattered throughout rugged bush country which was slowly being cleared; where there were only trails for roads which were sometimes made hazardous by bog and boulder. The sight of the dauntless little figure of the doctor on her rounds brought comfort and certitude from fear to her pioneer patients. During these years, Dr. Ross was also a busy housewife and mother. She bore ten children, three of whom died in childhood. She taught her daughters the household arts and in time the eldest took over much of the running of the house. She reserved for herself, however, the privilege of baking bread for her family. The log cabin was replaced by a spacious frame home. A devout woman, she taught Sunday School each week in the church for which her husband had donated the land and material. The ministers and priests travelling about their wilderness parishes found the Ross home a haven of warmth and hospitality. She was a very feminine woman. A photograph taken in her middle years shows a small, straight figure, (she was just over five feet tall) her curly hair drawn back from a calm brow, deep-set eyes, a beautifully cut mouth, firm yet tender. The practical black gowns she usually wore concealed the daintiest of undergarments, in which she delighted. She loved music and during her Montreal days, she had studied singing with the father of the famous Madame Albani. A faded photograph of her Victorian parlor reveals an ornately carved piano standing upon wolfskin rugs, as rare in the wilderness as a woman doctor. On this her daughters were taught to play, their music accompanied by the trill of the canaries she loved to keep. How often must the woman and the physician have warred within her? No one ever knew. Three children were born to her at Whitemouth. There must have been many times when she felt unwell or simply tired but no call for her help was ever denied. One poignant experience is known which is revealing of her strength and her compassion. Her young son became ill with pneumonia. She fought for his life with all the skill at her command  and lost. When it became obvious that there was nothing more she could do for him, she left the boy in his father's care and answered a call from a patient in labor. While Dr. Charlotte was helping a new life into the world, her son departed it. The baby girl she delivered that night grew into a fine woman, a devoted community worker who still resides in Whitemouth. After her years of practice in Whitemouth and the surrounding community, Dr. Ross retired to Winnipeg where she died in February, 1916. It was a great joy to her when a granddaughter, Edith Ross, graduated in medicine from the University of Manitoba in 1913, winner of the O'Donnell Gold Medal in obstetrics. In later years, Dr. Edith Ross presented the Dr. Charlotte W. Ross Gold Medal in obstetrics to be awarded annually in memory of her grandmother. This award was continued for many years by the University of Manitoba Medical Faculty Women's Club but now is being awarded by Dr. Ross's descendants. The name of Dr. Charlotte Ross has been honoured by her profession as one representing the highest tradition of the general practitioner. Over a century ago, this exceptional woman was beginning a career which would lead to a way of life in which her entire being would be fully engaged: wife and mother, physician and friend, pioneer and humanitarian. In the light of the current agitation by the Feminists, she casts a long shadow. It would never have occurred to Dr. Ross that she was 'expressing herself'. She gave unstintingly of her skills and abilities, her warmth and generosity and in doing so became a beloved legend in her own lifetime. * Dr. Ross B. Mitchell: Medicine in Manitoba.